See The Vice Presidents Expected At Tonight’s Nigeria Elections Debate. Vice-President Yemi Osinbajo of the All Progressives Congress and Peter Obi of the Peoples Democratic Party are already present in the vice-presidential debate organised by the Nigeria Elections Debate Group and the Broadcasting Organisation of Nigeria. Recall that five candidates were pegged down to slug it out at the vice-presidential debates. The candidates were selected earlier this week by the presidential election debates group and a group of broadcast stations affiliated to the Broadcasting Organisation of Nigeria (BON). Eddi Emesiri, the executive secretary of the Nigeria Election Debates Group, listed political parties that would participate as including: Allied Congress Party of Nigeria (ACPN); Alliance for New Nigeria (ANN); All Progressives Congress (APC); Peoples Democratic Party (PDP) and Young Progressives Party (YPP). 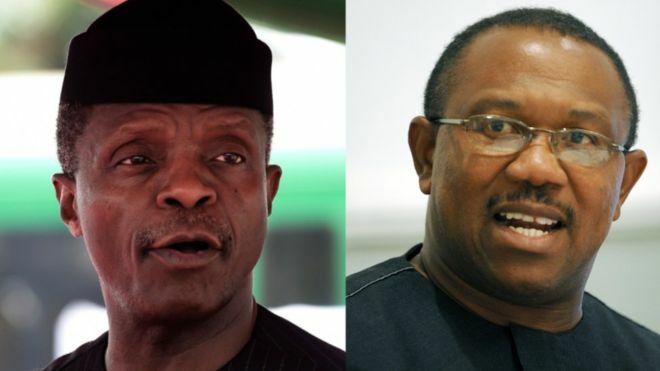 While Vice President Yemi Osinbajo is participating in the debate as the running mate to President Muhammadu Buhari, both seeking to retain their office for a second term, Peter Obi, a former governor of Anambra State and vice-presidential candidate of Atiku Abubakar would stand in for the PDP tonight. The VP candidates of ACPN, ANN and YPP are also expected to participate. Imoni Amarere, a broadcaster with African Independent Television (AIT), is moderating tonight’s debate, and has already taken his seat as of 6:40 p.m. The debate is expected to kick off at 7:00 p.m. The participants are likely to take questions from other key areas of national importance, which could range from health and education policy to national security and foreign affairs. The Economy of the country and Boko Haram remains critical issues that may draw attention for discourse in the debate.